Florida is chock full of beautiful places to enjoy nature. Check out these top state parks to visit during your travels in the Sunshine State. John Pennekamp Coral Reef State Park is a world-class park and #1 in the Florida state park system in attendance (a million visitors a year). The first undersea park in the U.S., it covers approximately 178 nautical square miles of coral reefs, seagrass beds, and mangrove swamps. Established to protect the only living coral reef in the US, it's famous for diving and snorkeling to view the coral reefs, which are among the most beautiful and diverse of all living communities. 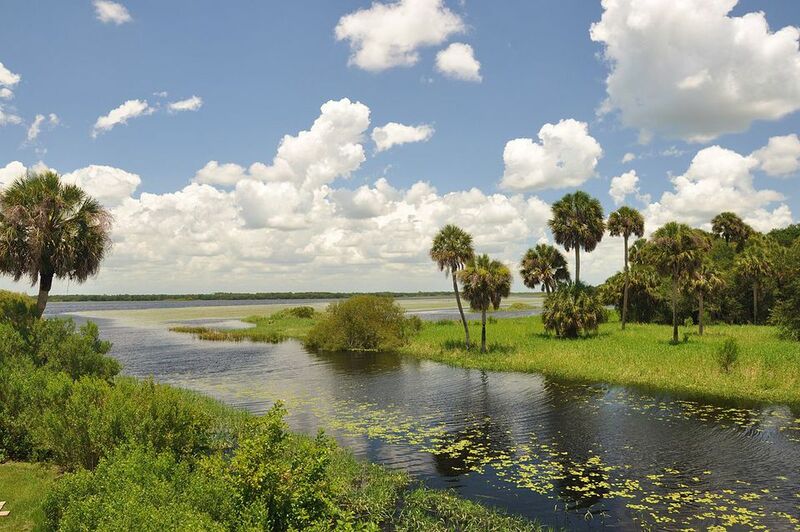 One of Florida's largest and most diverse natural areas, covering approximately 45 square miles, the Myakka River flows through the park for 12 miles. An airboat tour is available on Upper Myakka Lake, with a tram tour of the park's hammocks and river floodplain offered seasonally. Some 7500 acres of the park is designated a wilderness preserve. There are abundant cottontail rabbits, deer, bobcat, red-shouldered hawks, and other wildlife in the park. A 15-mile riding trail is available for park visitors who bring their own horses. Paynes Prairie is among the most significant natural and historical areas in Florida. The 20,000-acre preserve was a center for man's activities for many centuries--Indian occupation of the area dates back to 10,000 B.C. Ranger-led walks and backpacking trips offer exceptional opportunities for viewing the Preserve's diverse wildlife from an observation tower near the visitor center. Horseback riding for visitors with their own horses, bicycle trails, hiking trails, and camping are available. Wekiwa Springs State Park offers 7800 acres of wild scenery that show how central Florida looked when the Timucuan Indians speared fish in the spring-fed creeks and stalked deer in the uplands. Wekiwa Springs is the headwaters for the beautiful Wekiva River. The mainspring area pumps out 42 million gallons of water daily. A number of threatened and endangered plant and animal species are found at the park, including the Southern black bear and the American bald eagle. Popular activities include swimming in the cool clear waters of Wekiwa Springs and canoeing on the Wekiva River. A group camp with cabins, meeting hall, and dining facility, plus a family campground and primitive youth camping area are available. Features miles of white sand beaches, striking dune formations, and a heavily-forested interior. Its Gulf beach was rated #3 in the U.S. in the 1999 "Best Beaches Survey" conducted by noted coastal researcher Dr. Stephen Leatherman, known as "Dr. Beach." The park is an excellent birding area, with sightings of 209 species currently recorded. Furnished vacation cabins are located on the St. Joseph's Bay side of the park, and there are 118 campsites with water, electricity, picnic tables, and grills.